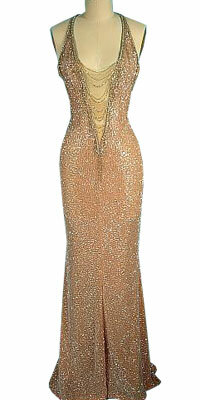 This stylish sparkling gown was once worn by Cher; it features a classy strap pattern revealing the well defined back of the wearer. The plunging neckline followed by the transparent material is an eye catchy feature making the wearer look exotic and elegant. The straight flowing hugs the body of the wearer making her look classy.